Photo Source: Forest, Bellatoni. The Venture Smith Homestead. Venture’s homestead is cornered by the Connecticut River and Salmon River. 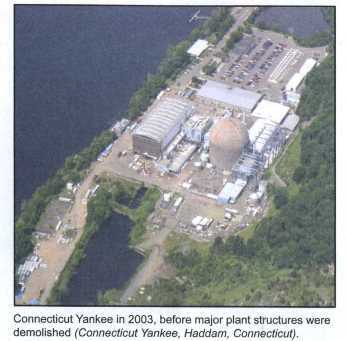 It is located on the grounds of present-day Connecticut Yankee Atomic Power Company. The area's plentiful wildlife, vegetation, agriculture, timber, natural harbors and fisheries attracted many settlers. 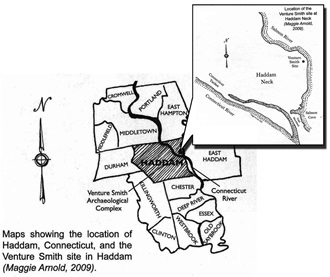 Haddam Neck's extensive natural resources supported the growth of mills, farms and manufactories and set the grounds for a thriving community. In the1968, the Connecticut Yankee plant was established in Haddam Neck. It was the world leader in nuclear generation from 1980 to 1984. However it was shut down in 2007. 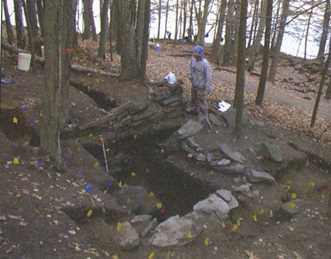 Upon closing, the State Historic Preservation Office surveyed the site and discovered it had great archaeological significance, most notably as the Venture Smith archaeology site. Venture’s property was located on a hillside and consisted of about eight different structures, in addition one main structure. The main house had two floors and a partial cellar. 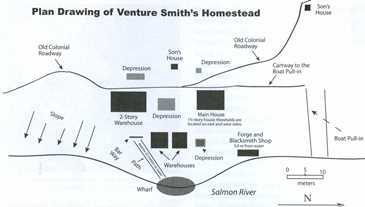 There is also evidence of a blacksmith shop, several warehouses and a strategically placed wharf to take advantage of the natural harbors.These structures are significant because they demonstrate Venture’s involvement in the local and regional markets. Venture was not just a freed slave but also a thriving member of the community. He had strong social ties with his white neighbors in addition to the black communities.